The pictures for this trip were taken on film and scanned from prints. This was before digital cameras folks. Sorry about the green tint of some of the pictures, that is the way we got them back from the print shop. Cloudy days turned green. Altitude sickness is a condition of the body that results from too little oxygen in the blood, which may be characterized by shortness of breath, fatigue, dizziness, headache, faulty judgment, and nausea: At about 8,000 feet people can begin to show symptoms of altitude sickness. Above 10,000 feet they become increasingly evident. People have died from Acute Altitude Sickness. 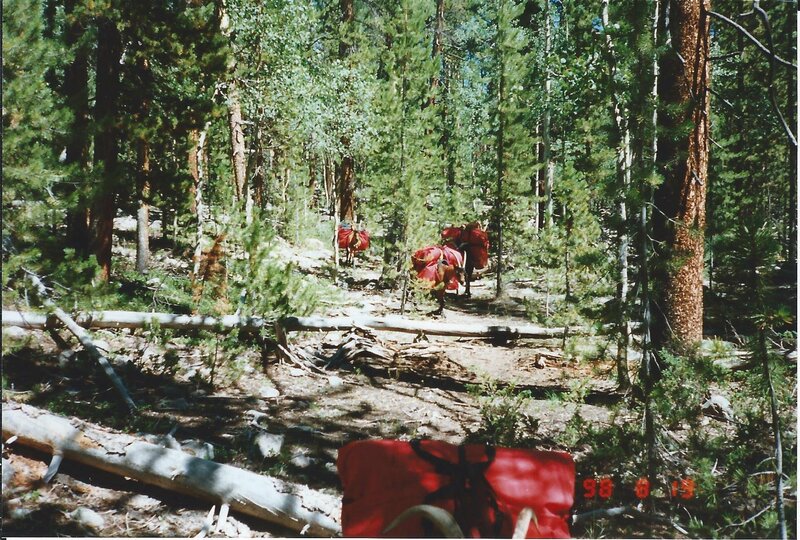 Our trip to King's Peak in High Uinta Primitive Area of the Ashley National Forest of Utah was put into the planning stage in 1993; planning, because of two major details. 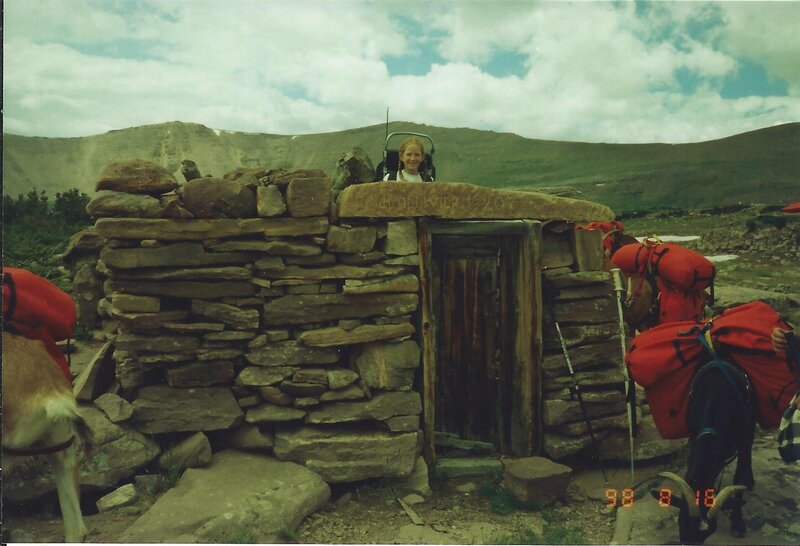 First: two members of our family suffer from altitude sickness. Second: one of us has major knee problems, prohibiting caring a backpack. So we looked into alternatives: Horses; too expensive for the return of work; Llamas; too Expensive and too temperamental; Goats; inexpensive, no added weight from food for them, go anywhere we can. We bought two large goats from a local herder. We quickly learned what goats NOT to get. Untrained adults did not work at all. The female babies didn’t grow nearly as big as we wished. 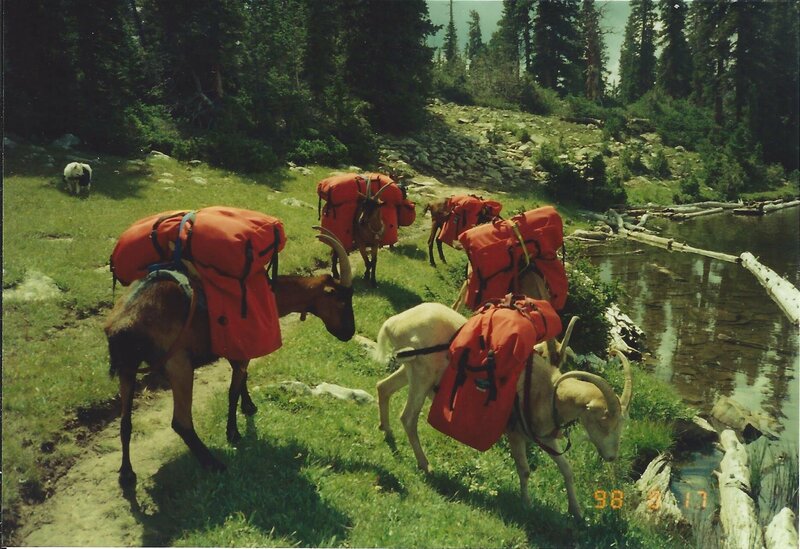 After 2 years of trial and mostly errors, in early 1996 we went to California to get Paco, and Levi, experienced packers, and three babies, Aries, Orion and Taz. We also got three babies for a near neighbor in exchange for his two year old, trained as a packer named Buck. Now we were ready to plan our big trip to Kings Peak. The first year was feeding, bonding and teaching. The babies were actually easier to water train as they had not yet learned to fear it. 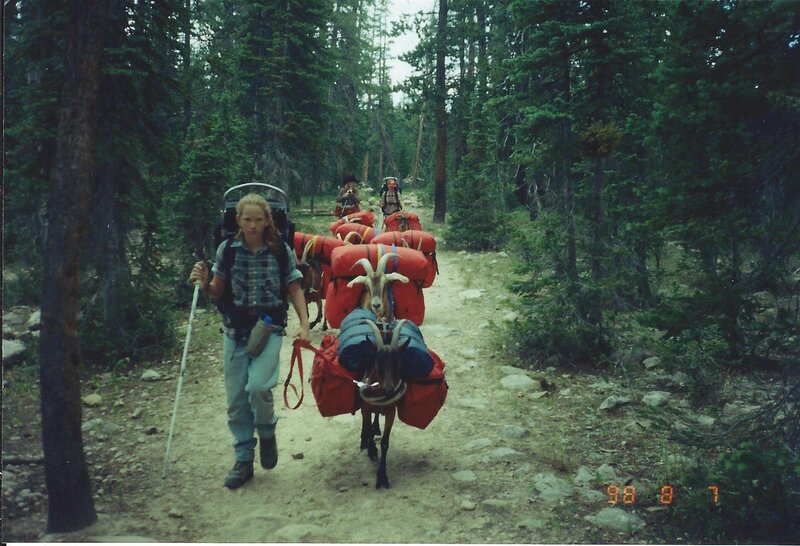 But miles and miles of trail, taught them that we loved to go, and taught us that the goats loved to be WITH us. 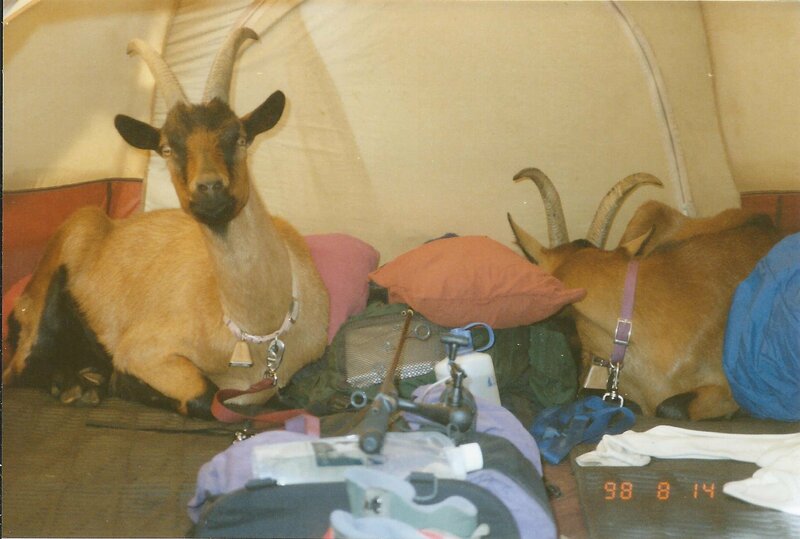 Our first overnighter with the goats, they would not even go to water without one of use with them. They always keep one of us in sight. 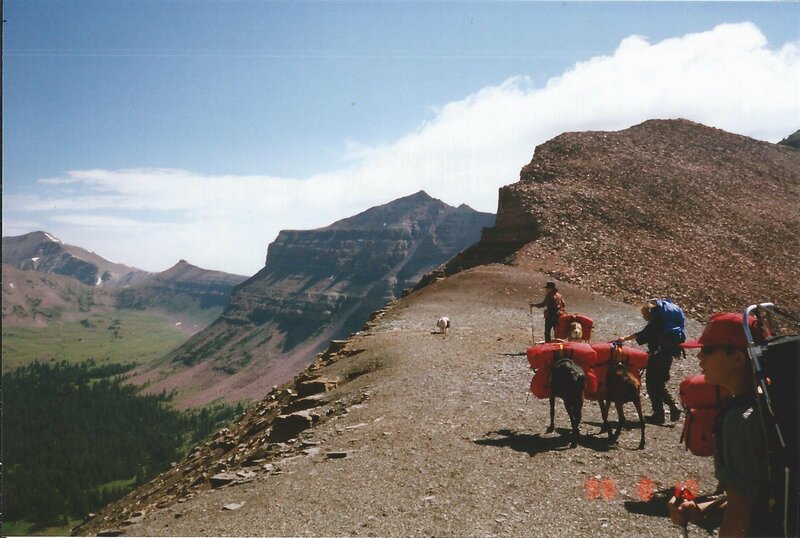 Our second overnighter, the first actual packing for the three yearlings, was up the back side of Mount Timpanogos. That night we picketed the goats because of the number of people around, but the people were amazed at how "gentle", how "well behaved" and how "curious" our goats were. 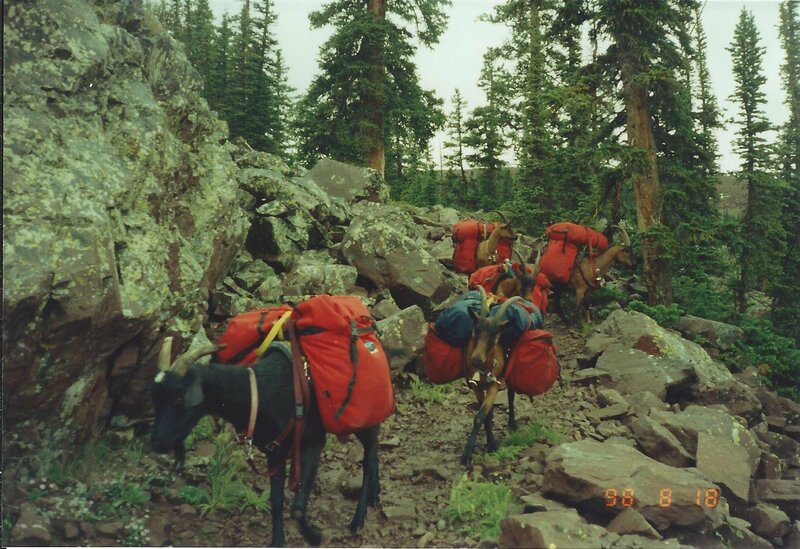 Then the winter of 97-98 set in, the goats got to vegetate while we planned, packed, weighed panniers and repacked. We had three two-year-olds that were limited to extreme light weight due to age. With two years of growing still to do, we didn't want to over pack them. But to get all of us to the top of King's Peak we were looking at 6 to 7 days getting into the Peak. A 14 day round trip for five people. Even with light weight, freeze dried, trail foods, the weight added up and added up and came out too much. But come the April thawing, the Zimmermans and their goats were in the fields just outside town once again. 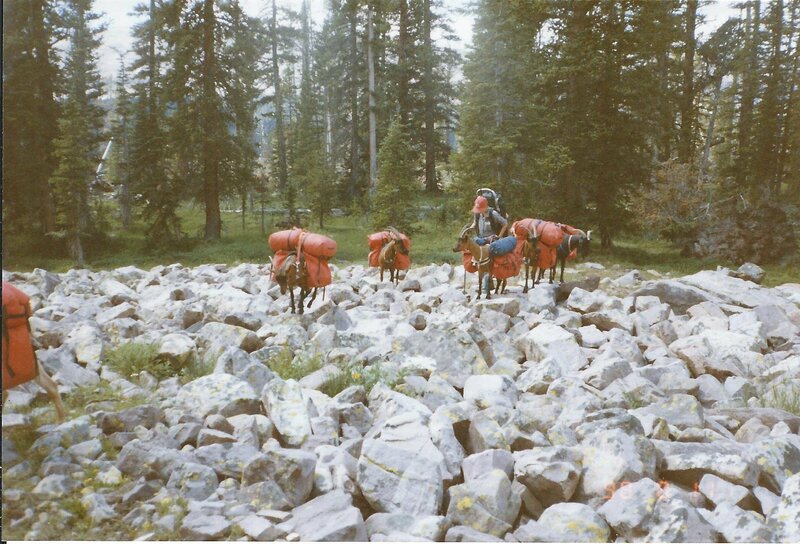 We were going 85 miles in one trip later that summer and the boys and us would be ready; if we could just get the total gear weight down. Then our son Walter (16) was accepted as a staff member for the Boy Scout of American camp on the East Fork of the Bear River. From mid June to late August he would be in the High Uintas, working. He would miss the trip to King's Peak, but would get to live in the same mountains for two months. He opted out for the job. 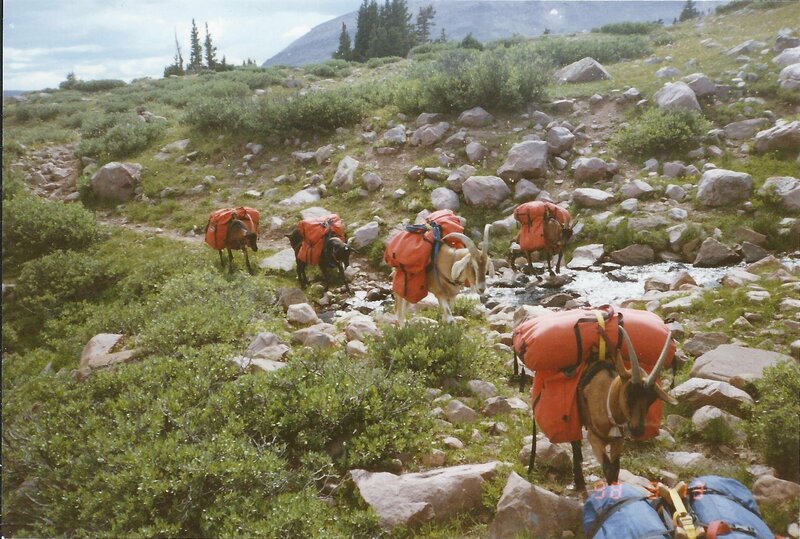 And suddenly the weight was in line with what the goats could carry. Three of the four people would have to carry some weight at first, but it was doable without overloading anyone, goats or Dad. But we added to the string that year also. In early June a friend had a late kid drop, one was a very big - for LaMancha - male. The owner being a dairy man didn't want to keep it, nor put him down. So Star joined the herd. We managed to get him weaned before the date of the trip; only just. 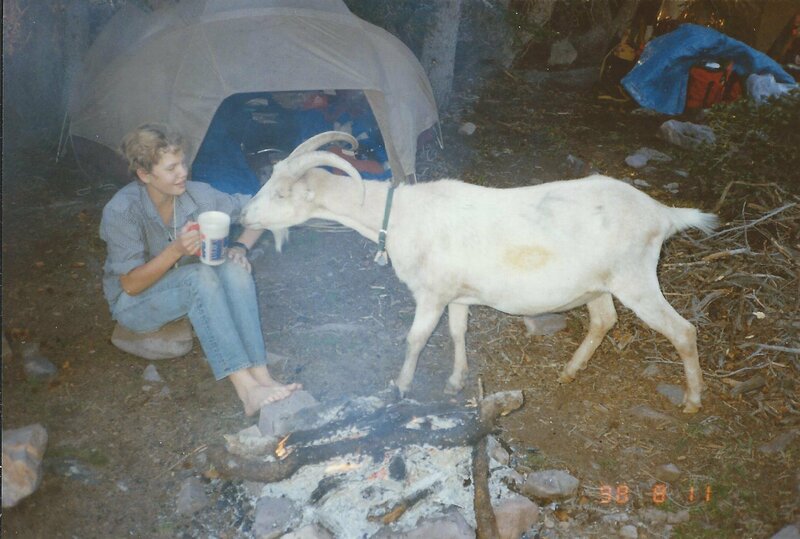 Then, one week from the go date, disaster struck, Paco - the herd dominant and our biggest goat - got very, very sick. We were able to save him and he still packed short trips a couple more years. But for that year, he could not make any trip. And without him, there were not enough bodies for the weight without giving Mom a pack. And that meant no trip, because Mom had the bad knees and was one that got Altitude Sickness. But by now we had contacts. So we asked, did anyone have word of an experienced packer for sale. We heard of four wethers in state, so we went to meet the goats. Charlie and Spot, both bigger in size than Paco, were added to our string. [A friend just starting in goat packing bought one of the others we looked at. I mention this because a year and half later when two of ours died, we acquired that same goat, Chocolate, into our string.] 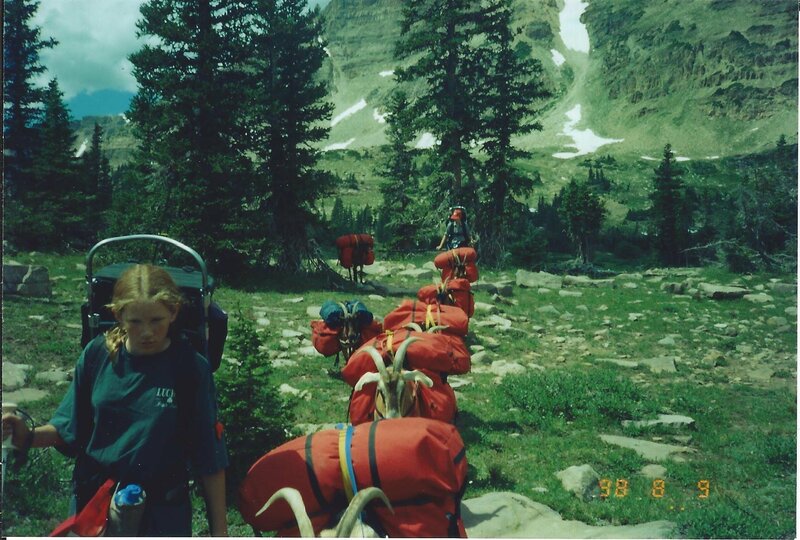 Finally on August 7, 1998, two weeks later than originally planned and with three of the four people carrying empty backpacks we left the Highline Trailhead. Dad (Clay), Mom (Charlotte), Adel (14), & Crystal (12); with "the boys" Charlie, Spot, Levi, Buck, Aries, Orion, & Taz set out on the big adventure. Poco and Star stayed home with our oldest, Rosella (18) who never did plan to go that year due to having a job. 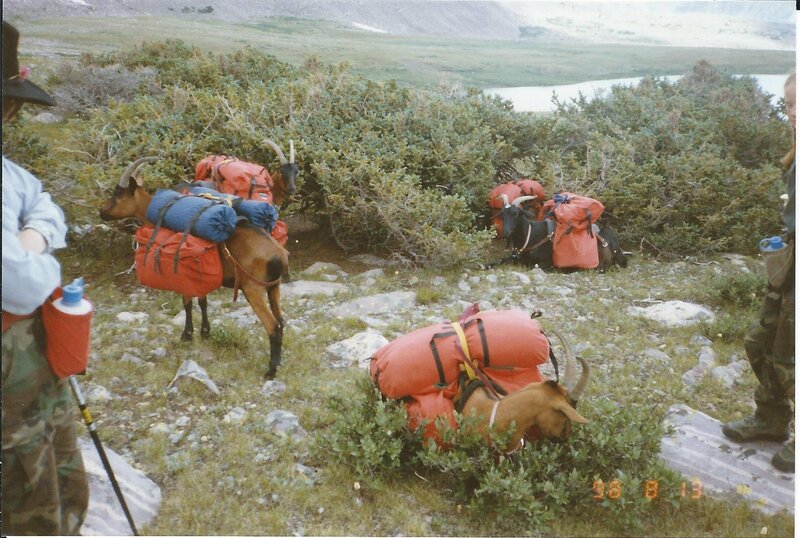 We learned just how versatile goats really are that trip. 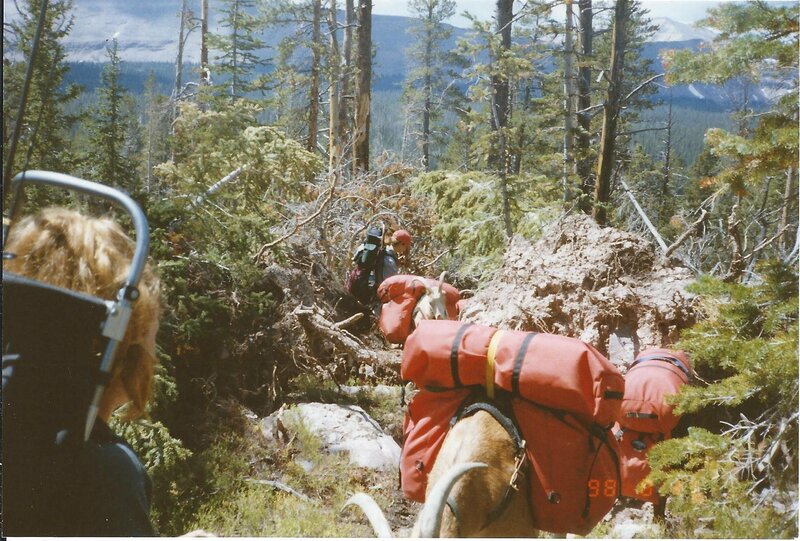 We hit a micro burst area where the wind had flatted the trees, right across the trail in a twisted dense mess. The only clear spots were the scree and rock fields. The boys handled the unforgiving rocks just fine. We also learned how funny goats are. 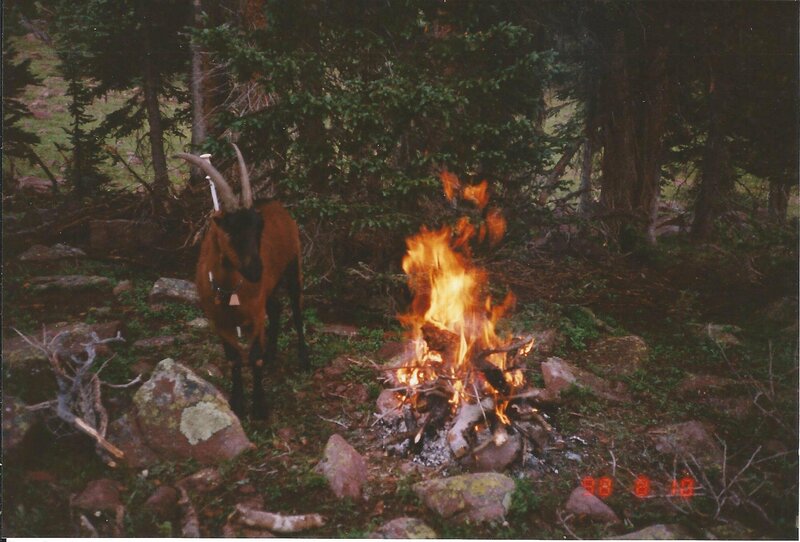 Being a very wet year, we could have real camp fires, and the goats would get so close and so hot, every few minutes we had to make them move. We learned this when Buck, who was white, singed the hair right off his side. 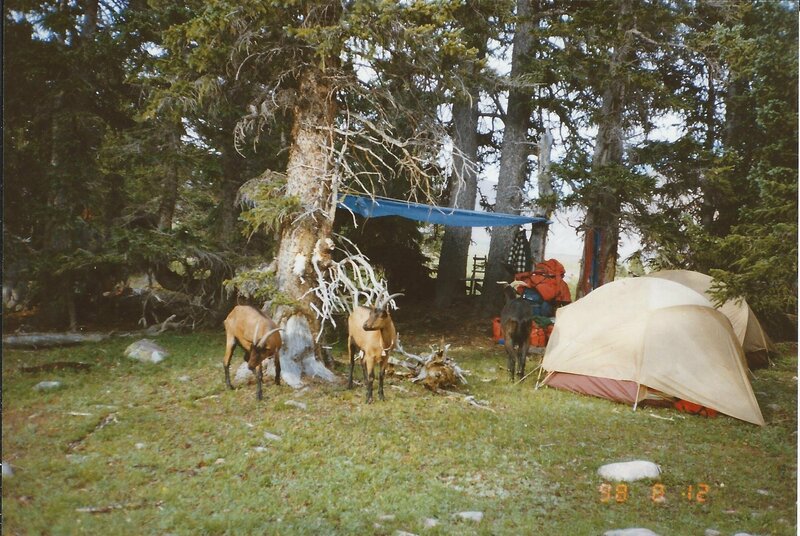 Then there was the day Taz and Orion shared the tent with Adel and Crystal for the afternoon rainstorm. Food was the main part of the weight, but cold weather gear was another factor. 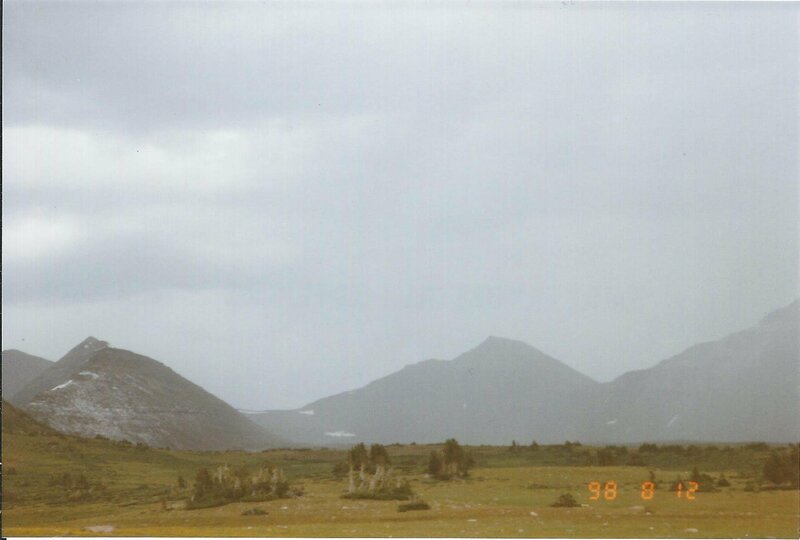 The High Uinta Primitive Area starts at an elevation of 9,000 feet and goes up from there. Afternoon rain showers or snow storms are common, and while our goats will go anywhere we will, they do not like storms any more than we do. In fact, it was a very stormy year, our coats and mittens spent more time on us than in the packs. 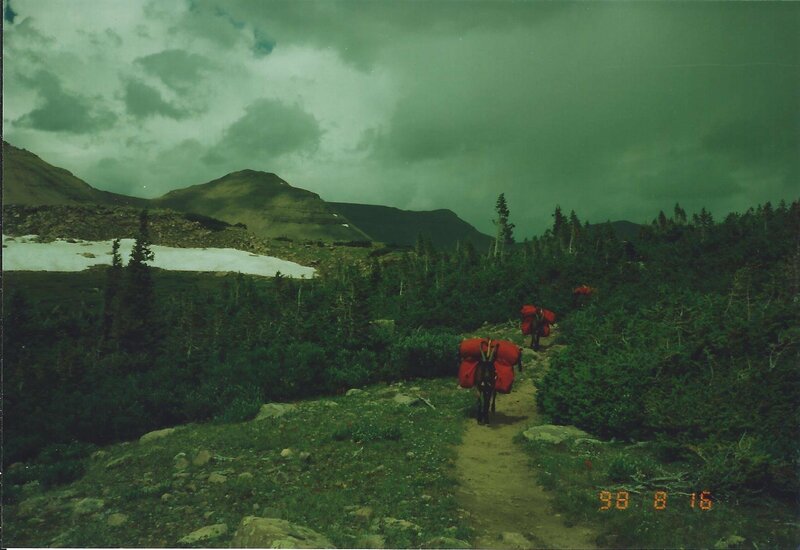 One day, well above timberline, we saw a bad snow/hail storm coming at us, and so did the boys. They headed for the nearest tree, singular, nowhere near big enough for everyone. The goats looked at us for help. Their rain tarp was the only shelter available. And it only took pulling one underneath it on the ground before all were jockeying for the center. We spent one and half hours under there, warm and cozy, and DRY while the world outside turned white. 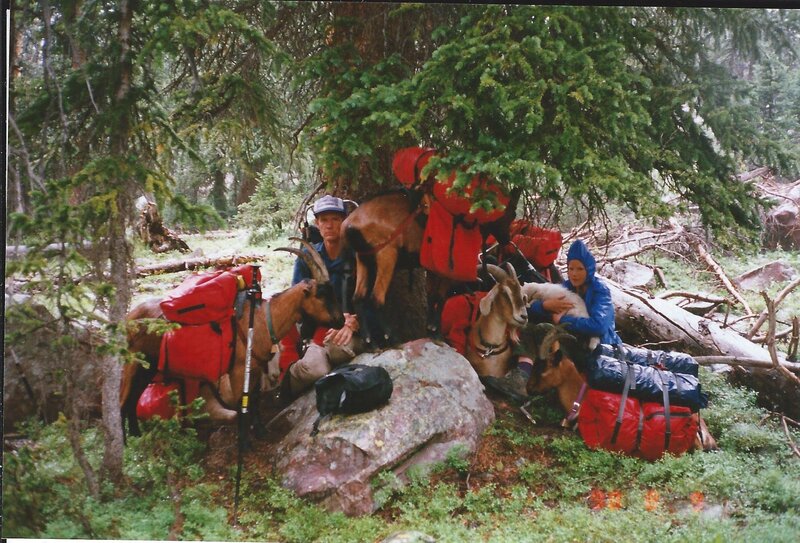 We camped soon after the storm ended, barely at timberline, with trees for cover. 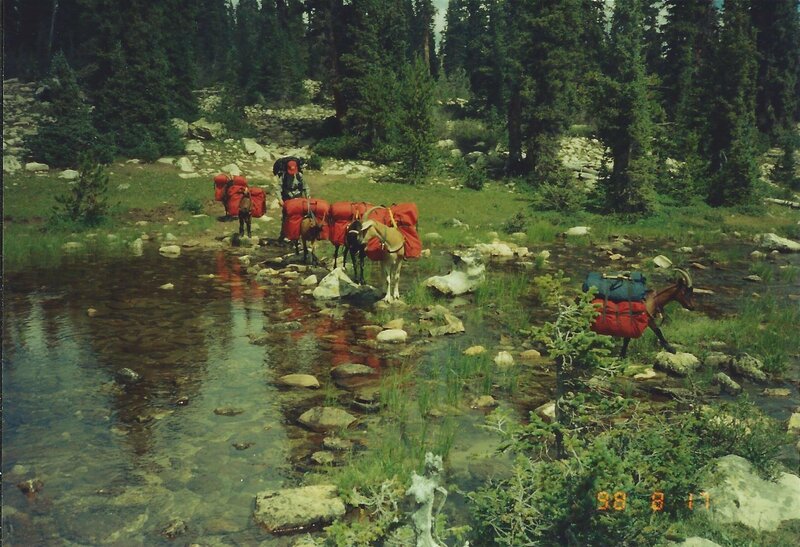 The next day we crossed the Porcupine Pass in bright, warm sunshine. We made it to just under Anderson Pass in seven days, and elected to spend one extra day at altitude before climbing the peak to help with acclimatization. So early on Saturday the 9th, we headed up Anderson pass. We had forgotten that it was Saturday, but the number of people at the pass reminded us in a hurry. We counted 39 people met on the climb to the Peak from the pass. 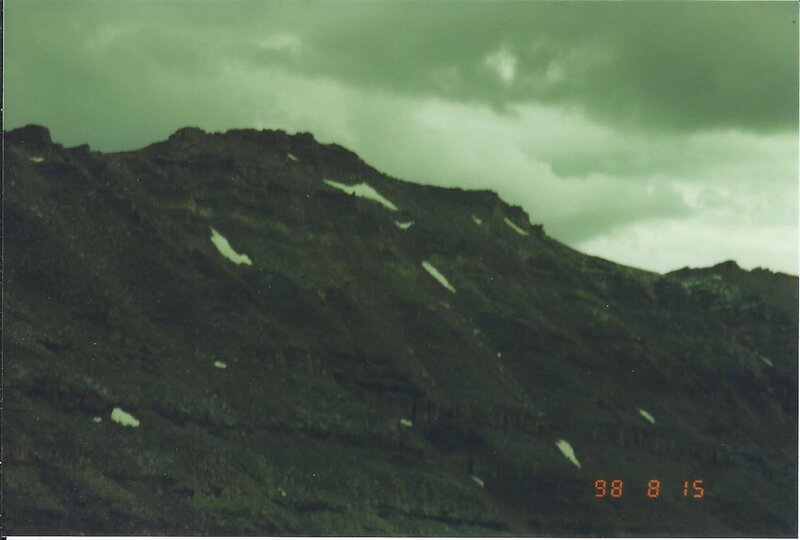 You see, there is a short way, (15 miles round trip) into King's Peak from the north. But is dangerous for people that know they get altitude sickness. We got "buzzed" on the top by a plane. Not us really, an 86 year old man whose grandson flew the plane. That was the good thing, but there was a bad thing that day. We had to help a lady down from the Peak. She had come the short way and made the top, and passed out shortly afterward. 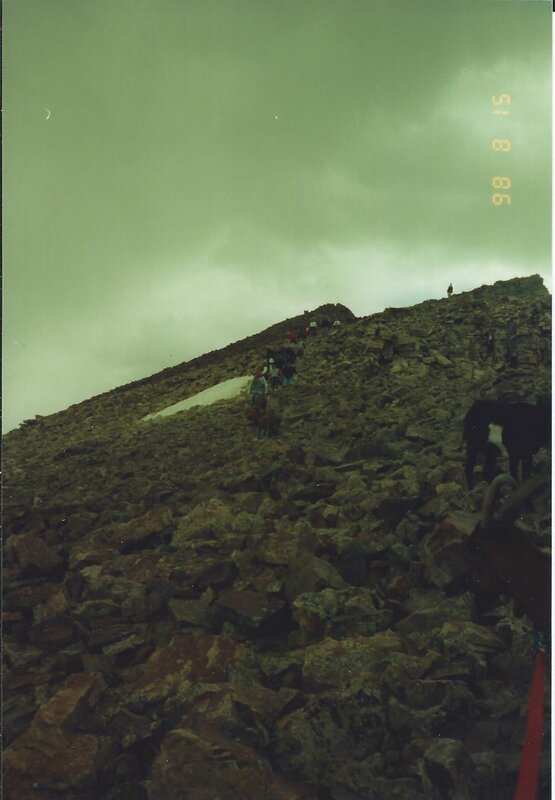 Altitude Sickness had hit hard, and most of the climbers that day had never even heard of it. Mom uses acclimatization to beat Altitude Sickness, (this works for animals too, who can also suffer from it) but once it hits there is only one cure. GET DOWN. 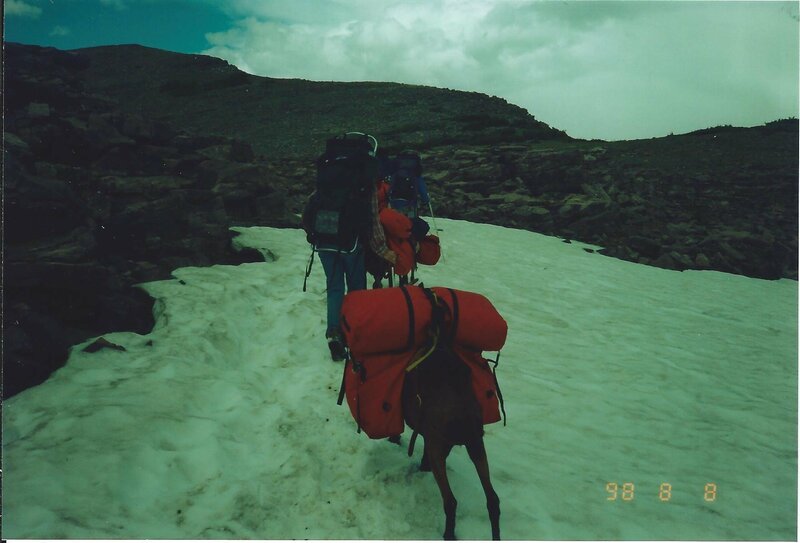 When the poor lady became aware of things around her again (about 12,500 ft) she saw goats. Not a very reassuring sight to see when you can’t remember the last hour. 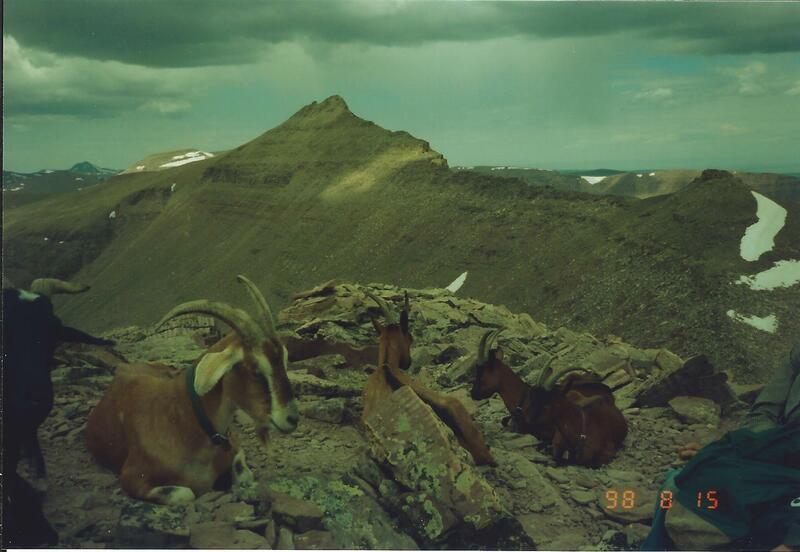 One of our goats was injured on the Peak also. 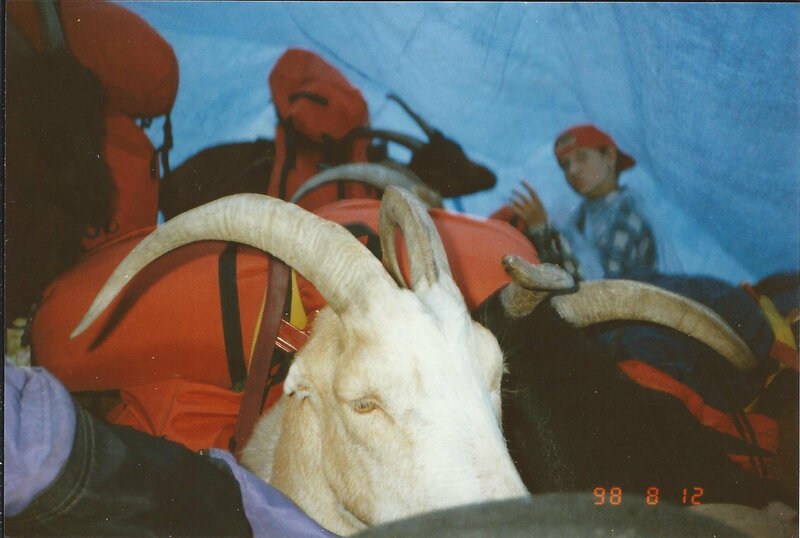 Levi, the biggest of our original goats, slipped between two of the boulders and twisted his ankle. We pulled the first aid kit from the bottom of one of the panniers and wrapped him good. He could walk, and keep up, but not with a pack. So we spent the end of the day repacking. Despite the fact that half of the food was gone, Dad still ended up with stuff in his pack; but nowhere near a full load. 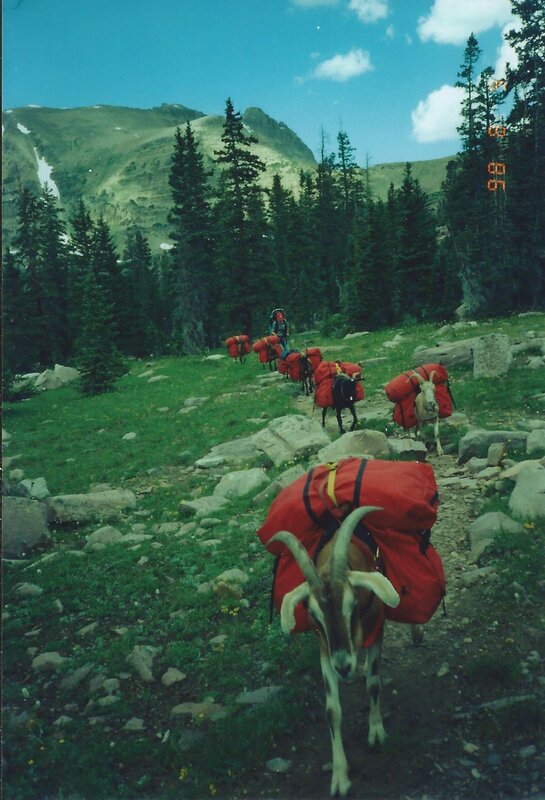 Yes, we still carry backpacks with the goats. We hope we don't have to use them, but as we learned the hard way, the unexpected DOES happen. It is better to be over prepared then lose a goat by pushing when it cannot give. Goats, like dogs, will give their people everything they have and still try to give more. Levi packed faithfully for another year, until an unfortunate barnyard accident cost us both him and Orion. We replaced them in 2000, and had to wait for Zeus and Crater to grow. But starting with babies is what we like best. Then we ARE their herd, and anything is possible. The pictures for this trip were taken on film and scanned from prints. This was before digital cameras folks. Sorry about the green tint of some of the pictures, that is the way we got them back from the print shop.